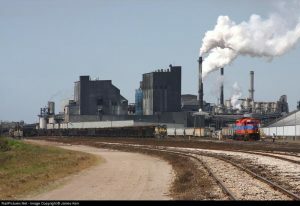 MODELING SUGAR PRODUCTION ON YOUR MODEL RAILROAD, PT1: THE RAILROADS AND THE MILLS – SMARTT: Scale Models, Arts, & Technologies, inc.
Drive up US 27 out of Fort Lauderdale, and you will see what looks like something right out of Dante’s Inferno, fires that appear to originate from the bowels of the earth! This, in fact, is an indication that you are near one of the most unique railroad operations in Florida, the harvesting and refining of sugar around Lake Okeechobee. Here in the black as coal soil of the lowlands on the south side of the lake is the last place in the US to use railroads to move raw sugar cane from the fields to the mills. The operation involves two railroads, trains that reach 130 cars of cane pulled by old rebuilt GP-7/GP-9’s and some really major industrial facilities that refine the cane. Let’s take a look at those Lake Okeechobee railroads. 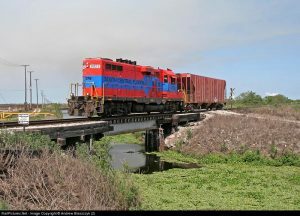 South Central Express, formally the South Central Railroad, has two lines that connect with other railroads, the CSX in Sebring and the FEC in Fort Pierce. 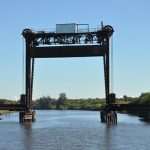 U.S. Sugar Corporation and USSG built its own railroad through the cane fields in two locations: one on the East side of the lake to serve their Bryant Plant and the second on the south side of the lake that serves the Clewiston Plant. The Sebring line (87 miles of track) is the former ACL branch that once reached all the way down to Everglades City on the Gulf of Mexico. This line was purchased from the CSX in June of 1990 by the Brandywine Railroad and named the South Central Florida Railroad. It was sold to U.S. Sugar in September of 1994 and renamed the South Central Florida Express. A second line was added in March of 1998 when SCFE reached an agreement to operate the FEC’s 71 mile K line from Fort Pierce to Lake Harbor. A car haulage agreement was also added into the deal. This allowed SCFE to interchange traffic to and from both the CSX and Norfolk Southern at Jacksonville, Florida. The ACL line has a very rich history. Originally built south from Lakeland, Florida, the line split at Palmdale. One line went east to Clewiston. From there the line reached the FEC at Lake Harbor. A second line went south and then east to serve packing houses on the east side of US 27. The line south from Palmdale went thru Labelle, Immokalee, and then on to Everglades City. The two lines had passenger and Pullman service as late as the 1950’s. The Everglades City line served logging of both pulpwood and cypress. Some of the cypress mills had their own logging railroad that was built into the Big Cypress Swamp, most notably at Copeland, Florida. Other commodities that this line hauled included oysters, produce, fertilizer, and general freight. The Clewiston line hauled sugar (both raw and refined), molasses, fertilizer, LPG general freight, and produce. The K line was built right after WWII to enable the FEC to abandon its original Kissimmee Valley Line from New Smyrna Beach to the lake. This shortened the distance between the FEC mainline and the lake considerably, and it allowed for the abandonment of some highly unprofitable trackage. The line ran basically straight as an arrow from Fort Pierce to the lake and then turned south and west to Lake Harbor. Business on this branch was sugar (raw and refined), produce, general freight, and fertilizers. Today’s South Central Florida Express looks like a big U, with one side starting in Sebring, running south around the lake, then back north to Forth Pierce. The condition of its physical plant is much different than when it first came into being as the SCFRR back in 1990. Today the line south from Sebring has been completely rebuilt and brought up to class two status, enabling trains to run at 25 mph. This more then doubles the speed the line was allowed to operate at when it was first acquired. The former FEC K line is in much better shape. Trains are allowed to run faster than 30 mph. 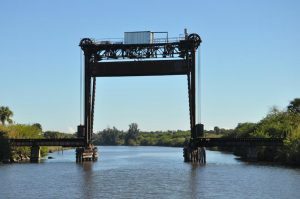 One of the highlights of the K line is a center lift span bridge near Port Mayaca that spans the Saint Lucie Canal. Back on the former ACL branch, there are two short spurs on the line, one at Palmdale that serves a pulpwood loading facility and a second at Moore Haven that runs 2.2 miles to a new fertilizer distribution facility. The fertilizer facility produces over 1000 car loads annually. Sugar Cane and its refined products are the most important reasons for the railroad’s success. In October of 1998 U.S. Sugar opened its new cane sugar refinery at Clewiston. This helped to increase SCFE carloads from 41,000 in 1994 to 73,000 in 2003. You see this in the length of the trains that interchange with CSX and the FEC. Another very interesting part of their sugar operations are their cane jobs. The term “cane jobs” refers to those trains that serve the various raw cane loading facilities out in the cane fields. How this works is raw cane is cut then loaded into carts pulled by tractors. There could be as many as six carts behind a single tractor. The tractors bring the carts over to something that looks similar to a truck loaded coal tipple. Here the raw cane is dumped into the loader, and then in turn it is loaded into the cane hopper cars. The cars are high sided gondolas in which one side of the car is hinged; this allows the car to be dumped in a rotary dumper at the mill. These trains sometimes reach a length that exceeds 50 cars. SCFE and U.S. Sugar locomotives at the Clewiston mill. The locomotives that SCFE uses are very interesting, consisting entirely of GP-7’s, GP-9’s, and GP-18’s with many of them former Illinois Central RR, Paducah shop rebuilt GP-8’s and GP-11’s. There are two former SCL GP-9’s that were rebuilt into GP-16’s by the Waycross Shops back in 1980. They both emerged in Family Lines paint. The GP-18’s are former Grand Trunk & Western Locomotives. 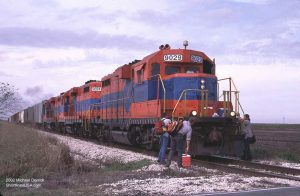 All the locomotives are painted in the original SCFRR paint scheme; the colors of the University of Florida, orange and blue. There must have been a Gator fan who did the design work! U.S. Sugar Corporation’s railroad operations center around their two Lake Okeechobee processing facilities, Bryant and Clewiston. U.S, Sugar operates 120 miles of track on their two operations. The railroad owns 14 locomotives, and 1000 cane cars; these cars are described above. However, I do want to add that as late as the 1990’s many of the cars were the old wood composite side dump gondolas. Like the SCFE cane jobs, the U.S. Sugar cane jobs operate from the loaders in the cane fields to the dumpers at the mills. The big difference here is U.S. Sugar trains can be as long as 130 cars and pulled by two locomotives. Both railroads operate 24 hours a day, seven days a week during the cutting season. The U.S. Sugar locomotive fleet includes two SW-1200 switchers from EMD; these locomotives work the yards at the two mills. The cane jobs are pulled by low nose GP-7’s, GP-9’s and GP-18’s (high hood), painted in a gray and yellow scheme. Both rail operations are a first generation diesel fan’s heaven! The U.S. Sugar operation was also famous for operating steam locomotives into the early 1960’s. Many a former FEC steam locomotive made its way into the cane fields after that road dieselized. Former FEC 4-6-2’s were the favorite power in the cane fields, #153, #113, and the 148, all now preserved, were once on the roster and then later donated to museums. Two of them, the 113 and the 153, are at the Gold Coast Railroad Museum in South Miami, Florida. 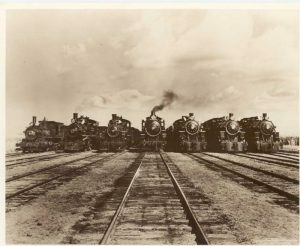 U.S Sugar steam locomotives at the Clewiston Mill. If you are interested in seeing this operation, you’d better not put it off too long. There is a possibility that the land U.S. Sugar owns, including the railroads and mills may be sold to restore the Everglades. However, an ambitious deal that was worked out in 2008 has apparently fallen through; a much watered down version is now being considered. It is not hard to railfan most of the operation, both paved and good dirt roads follow the tracks. A check into the rail operations offices would be smart; both are in Clewiston. The harvest season starts in the middle of October and runs through the middle of March. The trains that interchange with both CSX and FEC run five days a week all year. This is truly a very interesting operation that has gotten very little attention in the railfan press. There are some nice places to sleep in Clewiston as well as restaurants, and if you like to bass fish, Lake Okeechobee is legendary. If you are going to South or Central Florida, take the time to check it out, you will not be disappointed! Three Paducah rebuilds on a CSX connection train. Update: In 2015, SMARTT built a detailed model of a section of US Sugar. Have a look!